Let not many of you become teachers, my brethren, knowing that as such we shall incur a stricter judgment [greater condemnation]. For we all stumble in many ways. If anyone does not stumble in what he says, he is a perfect man, able to bridle the whole body as well. Whether we like it or not, almost all of us find ourselves in the position of teacher many times in our lives. One cannot truly be a parent unless one is also a teacher, for even if we do nothing in such a position, we have taught a lesson to our children. This is why it is so important for us to perfect in ourselves "the truth as it is in Jesus", and work at becoming perfect as our Father in heaven is perfect (Matthew 5:48). In the year 1725, being in the twenty-third year of my age, I met with Bishop Taylor's Rule and Exercises of Holy Living and Dying. In reading several parts of this book I was exceedingly affected, that part in particular which relates to purity of intention. Instantly I resolved to dedicate all my life to God, all my thoughts, and words, and actions; being thoroughly convinced there was no medium, but that every part of my life (not some only) must either be a sacrifice to God or myself, that is, in effect, to the devil. Can any serious person doubt of this, or find a medium between serving God and serving the devil? Wesley rightly came to the conclusion that there is no middle ground where we can serve both the Lord our God and the devil. We must choose one or the other. We cannot serve God on Saturday or Sunday morning and the devil the rest of the week, for if we do, we are actually the devil's disciples and not Jesus'. The only way that God's perfection becomes incorporated in our lives is through our serving the Lord and Him only. Each and every one of us needs to continually ask ourselves a question: What will be the effect of what I do and say and write upon the lives of others; and, is that the effect that God desires? Christian perfection leads us to do only those things that God desires. However, there is another very important step in our Christian perfection, as we will see in the next chapter; but before we go on, there is a story that brings home the intent of this Chapter, which we should contemplate very seriously. Our society has become so desensitized to the natural sensitivities that God created in our being, that we become callous in the ways in which we respond to our children. In so doing, we can cause severe trauma and destroy our children's developing faith and sensitivities. At the 1999 NAVS Summerfest on the University of Pittsburgh's Johnstown campus, author, lawyer, and lecturer, Jim Mason told us of how this occurred in his life. When Jim was five years old he walked out into the back yard of his farm home in Missouri, and for the first time in his life, saw pigs being slaughtered. He saw their bodies hanging from a tree. What he saw and smelled and heard so traumatized his God-given sensitivities that he became seriously ill and suffered nightmares for days, and had to be taken to his aunt's home for a while. Jim said, "I was reluctant to return to the farm. I still have a memory blackout of that time. My last memory is the image of those pigs' bodies hanging from the tree, the tub full of heads, and the blood." For several years after this, this family would also send young Jim to his aunts when they were slaughtering animals. This many-generation Methodist family only recognized that Jim had a problem with "growing up". They never recognized the hardness of heart that they were exhibiting, and how they might not be living in the knowledge and perfection of the Lord. This conclusion was amplified when Jim was eleven years old. The "men" of the family were going to castrate the calves, which Jim knew was very painful for the calves, for he had previously heard their cries of pain. When he held back from following them, he was told to either go back to the house with the women, or become like the men and go to the barn with them. Here was this sensitive lad being faced with the dilemma of being called a sissy and a girl, or becoming a "man" by being hard of heart. Today, he says that he should have gone back to the house and learned to cook, but he didn't. He went with the men. Such treatment left Jim feeling very much alone, for in his heart he knew the truth that animals are sensitive, loving and feeling beings, just as we are. His only real friend became his dog, and the two were very close. When Jim was thirteen his dog died, which left him heart-broken. Jim's family has a long Methodist tradition, and Jim had what he considered to be a strong belief in God. Jim knew in his heart that animals had souls and spirits, just as we do. He knew it because he observed these beings on their terms, and because of his relationship with his dog. Reaching into his faith, Jim reconciled his sorrow with the fact that he would once again see his friend in heaven. When he went to his pastor and asked for confirmation of his conclusion, his pastor looked sad, but told him that animals don't go to heaven. Immediately, Jim's faith was shattered. Better this pastor had tied a millstone around his own neck and drowned himself than do such injustice to this sensitive child. 1 At that time the disciples came to Jesus and asked, "Who is the greatest in the kingdom of heaven?" 3 And he said: "I tell you the truth, unless you change and become like little children, you will never enter the kingdom of heaven. 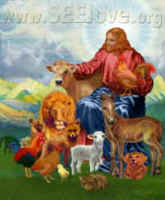 Nowhere in the Bible are we told that animals don't go to heaven. To the contrary, we are told that they are living souls just as we are. Even if this pastor didn't fully understand this, he could have said, "The Bible doesn't tell us, but we can hope and pray that it's true. Would you like me to pray with you?" But this pastor didn't do this. Our societal influences had so corrupted this man's faith and sensitivities, that he was likewise blinded to the truth. Jim has since turned his attention to helping people become more loving and compassionate toward all of God's non-human creatures, but he has never returned to the church from where he saw much of this hardness of heart coming. Since Jim told us this story, we have retold it many times in this context, which has had a positive effect on Jim, too, for he knows that not all Methodist pastors are like the one from his youth, and that God is not to blame for his pastor's or his family's actions. There are millions of Jims all over the world, and we need to think about their sensitivities before we say or do anything, for what we do and say will have an effect on their lives. 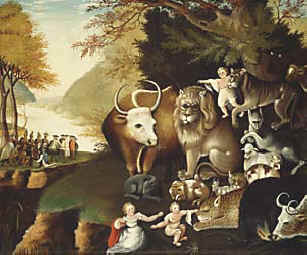 We have a responsibility to all creatures (both human and non-human) and to God to do all things in the perfection of our Father who is in heaven.